It fills my heart with joy every time little one and I talk about Puerto Rico. About it’s white sandy beaches, the lizard peeking through the window, the blazing sun, the coquí that he heard for the first time, the outpouring of love from la familia, and Abuela’s rooster singing in the wee hours of the morning. These memories of life in The Enchanted Island of the Caribbean will forever live with him, and be part of who he is. Note: This post contains affiliate links, which means that if you click on one of the product links, I’ll receive a small compensation. 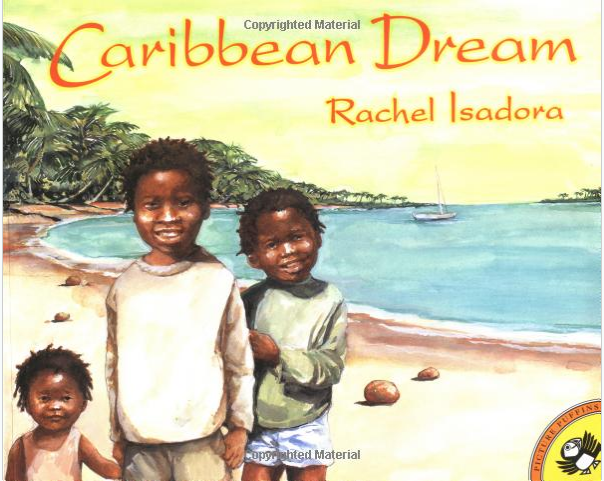 Caribbean Dream by Rachel Isadora is a beautiful multicultural book set in the Caribbean. It is an easy to read-aloud book with rhythmic structure. Perfect for my up-and-coming reader who is only 5 yrs. old. I love this book, and how my son can relate to it, and identify with the children in the illustrations. He can see someone that looks like him, and how wonderful it is to live in the Caribbean. The book starts with a simple, “Where morning meets light, we rise.” With Black children peeking out a window. Then it explores island life in all it’s splendor and beauty with nature scenes such as, the beach, and the hills. The illustrations are breathtaking to include family, friends, school, and culture. Such as, children listening to an elder sharing stories, or shopping at the open-air market with bags of food topped on their heads. Although this book is set in the Caribbean islands we can not say it’s from a specific island. We looked at the map of the islands, and he quickly found Puerto Rico. We talked about the surrounding islands on how they are all different in size but alike at the same time. It is clear to me from our conversation that I have done my part in planting the Latin and Caribbean heritage seed in our son. This book just reinforces our love for our Caribbean island. This sounds like a lovely book and the illustration on the front cover is beautiful. This book sounds wonderful! I spent a wonderful two years in the Cayman Islands and return as often as I can because some of the dearest people in the world to me are still there. It's funny how the Caribbean plants itself so permanently in one's heart! Thanks so much for taking me home for a little while by sharing this at Booknificent Thursday!